About 50 federal and state vessels participated in the West Coast Maritime Pilot exercise on Puget Sound on Wednesday. Law enforcement and first responder personnel conducted radiological screening of small vessels for the drill. SEATTLE — More than 300 trained maritime law enforcement and first responder personnel from federal, state, local and tribal agencies participated in an operational maritime exercise in Puget Sound this week. Maritime law enforcement and first responders conducted non-intrusive small vessel radiological screenings at three Puget Sound security zones located at Admiralty Inlet, Bellingham Bay and North Skagit Bay. The exercise is part of a pilot demonstration funded by the Department of Homeland Security Domestic Nuclear Detection Office to evaluate radiation detection sensors and operational protocols for the small vessel maritime environment. Small vessels are considered watercraft under 300 gross tons such as recreational boats, yachts and small commercial vessels. Pacific Northwest National Laboratory coordinated activities with the Coast Guard and Customs and Border Protection, and many other state, local and tribal agencies for the two-day event. Team members used radiation detection equipment ranging from portable hand-held sensors to boat-mounted systems. The Puget Sound was selected for the pilot demonstration because it is home to the third largest commercial and naval port in the U.S, hosts the nation's largest ferry system, and sees significant small vessel traffic regularly entering U.S. waters across the 125 miles of open maritime border. Increased boat traffic on the Sound is anticipated during the Winter Olympics games to be held in Vancouver, British Columbia, in 2010. "Our goal was to coordinate efforts by DHS and regional partners to prevent illicit radiological or nuclear materials from entering Puget Sound waterways by way of small vessels," said PNNL Maritime Project Manager Bill Peterson. "The exercise allowed us to operationally assess these advanced technology systems and protocols." The pilot directly supports the DHS Small Vessel Security Strategy, which serves to reduce potential security and safety risks on our waterways and at our nation's many ports. DHS's Domestic Nuclear Detection Office invested $3.5 million in equipment and training for state and local personnel in preventive radiological detection for the Puget Sound pilot. "Our objective is to safely identify and interdict radiological materials as far away as possible from populated areas and critical facilities," said Captain Dave Crowley, USCG at DNDO. "And, while this improves the region's security, it's essential our efforts cause minimal impact to routine commercial and recreational boating activities." During the event, PNNL worked with DNDO to coordinate with various federal, state, tribal and regional maritime partners to provide guidance on operational protocols, equipment, equipment training and exercise development for the pilot. While authorities stress that no known current threat exists, the opportunity did provide DNDO and its partners a chance to conduct the exercise under real world conditions. The partnering agencies assessed the geographic layout of the ports and designed a method to maximize detection and interdiction opportunities away from populated areas and critical infrastructure. "This week's effort shows we can add another layer of defense and security to Puget Sound waters with minimal impact to law abiding small vessel operators," said Peterson. Pilot participants included the U.S. Coast Guard (Sector Seattle, Group Port Angeles, CG Auxiliary), Customs and Border Protection (Office of Air and Marine Operations, Field Operations), Federal Bureau of Investigation, Puget Sound Area Maritime Security Committee, Washington State Emergency Management Division, Washington Department of Fish and Wildlife, Washington State Patrol, Washington Department of Health, Washington State National Guard 10th Civil Support Team, Whatcom County Sheriff, Skagit County Sheriff, Snohomish County Sheriff, Seattle Police, Port of Seattle Police, Seattle Fire, Tacoma Police, Edmonds Police, Everett Police, Port Orchard Police, Bainbridge Island Police, Suquamish Tribal Police and the Port of Everett. In September 2007, DNDO announced the creation of a three-year West Coast Maritime Pilot program. 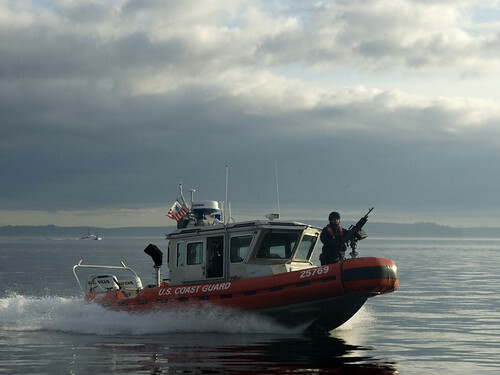 It provided an opportunity for state and local authorities in Washington's Puget Sound and in the San Diego, California, area to better understand the current prevention and detection capabilities and to develop a concept of operations on how to detect and interdict potential threats on small vessels. It also provided an avenue to interact and participate with various federal, state and regional maritime, technical and law enforcement entities.